Disclaimer: The Vizio M-Series TV sent to us for the purposes of this review is a demo unit sample and does not have to be returned. Thank you to Vizio for giving us this opportunity. We are going to try something different today with a TV review, instead of an audio-based product review! I might be interested in tackling more non-audio focused reviews in the future, so if you enjoy this article and want more similar content and publications like this, please let me know in the comments area below. I’ve always been a videophile as well as an audiophile. I’ve owned almost all of the best LED and OLED TV’s out there and would love to share my thoughts and opinions on the current market with our subscriber base here on Headfonics. Vizio and I have partnered for this review. So before continuing, I would like to thank them for bridging to me and helping me bring this review to you. It could be the start of something more for me with regard to non-audio focused reviews! So, that is extremely exciting to me. They’ve sent me their $999 M-Series M-F0 which is a 65-inch model. Yes, this is a 4K model and of course, I will cover how the stock speakers sound a bit as well. 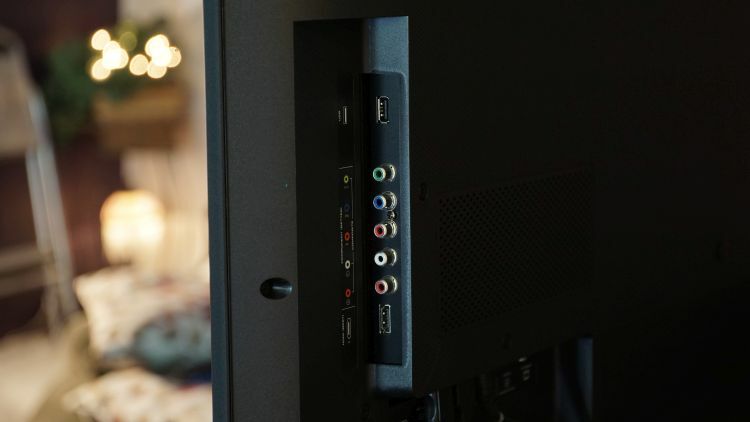 The M-F0 comes with two solid aluminum stands that need to be screwed into the mounting bracket on the underside of the TV. These don’t budge at all when I use my electric screwdriver to fasten it all. The added torque is very appreciated and thankfully the M6 screws are very good quality and solid as well. The stand doesn’t jiggle, thankfully, which is a problem my TCL had and yep, even my Sony 900E which I had to mount to my wall just because I felt like the stand was actually not good enough for it. Vizio’s stock stand is from VESA, so it is pretty solid. The bezel-less design is fantastic, although, of course, if you want ultra-thin then OLED is what you want to purchase. The M-F0 has a rear and offset to the left entry for all of the ports and cable needs, excluding the power cable, which is on the far right side. I do enjoy how well the ports actually function with stability. Meaning, on some of my other TV’s, these HDMI and optical ports actually will also jiggle a bit. That isn’t an issue here, they are all properly and snugly mounted, thank the A/V deities. The entire edge work around the monitor itself is metal, which offers a premium look to the TV when showing it off to friends and family. Local Dimming in monitors is something I desperately need in my viewing experience. What that means is that there are specific zones in the panel itself that will dim the LED areas around what the picture on the screen is displaying with regard to black level. When the image is attempting to showcase a very dark “something” on screen, the panel will respond to that by dimming the LED zone closest to that black zone in the media you are watching. The more dimming zones the panel has, the better the black level and true black potential will likely be. The result is a vivid contrast between the deepest blacks and the brighter areas on the screen during the visual experience in your media. This M-F0 has 40 local dimming zones, which for the price, is very nice. By comparison, my Sony X900E (which at the time I purchased had a price tag of $1800 and that is considered the best overall LED panel on Earth even now in 2018) has an estimated 45 local dimming zones. Sadly, Sony will not disclose the real number and you’ll have to rely on live dimming tests on Youtube for proof of that. What this means is that the black level of the M-F0 is excellent for the price. However, TCL’s 6-series $999 65inch model is a serious beast by comparison to both the Sony 900E and the Vizio M-F0 with a staggering 120 local dimming zones. Prior, I’ve owned the $600 or so TCL 401 in a 65-inch model and I can safely say that the black level on that lower end model is comparable to the M-F0 at $999. If black levels are your thing, go back to a nice plasma or invest in one of the newer TCL’s instead. For now, Vizio’s M-F0 is a good bargain for the price with regard to black level, but there are certainly nicer options out there. My last gen Panasonic plasma has equally deep blacks as this new generation M-F0 LED. 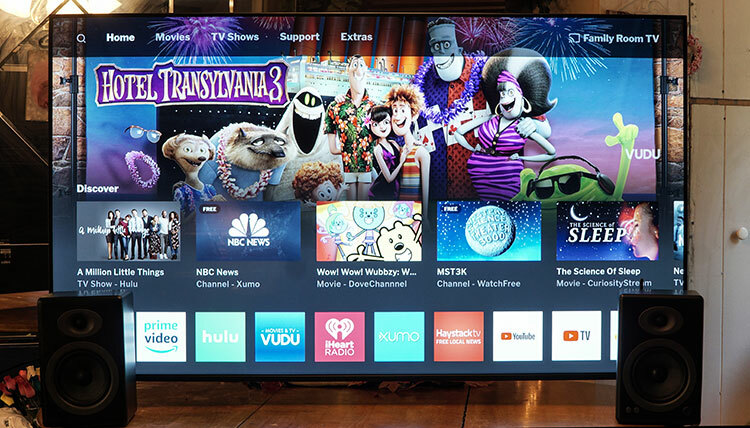 If you have a nice 4K Bluray collection or watch content in 4K, then you might want to make sure to purchase a future-proof TV when it comes to 4K HDR support. I would prefer to preset my custom options with a Vivid setting and get more brightness and sharpness through that. I am not into the realistic color set, just like my audio subjective based preferences, I prefer musicality and exaggeration and not purity and realism. I like fun, popping colors without going too far and I can’t get that with HDR active. 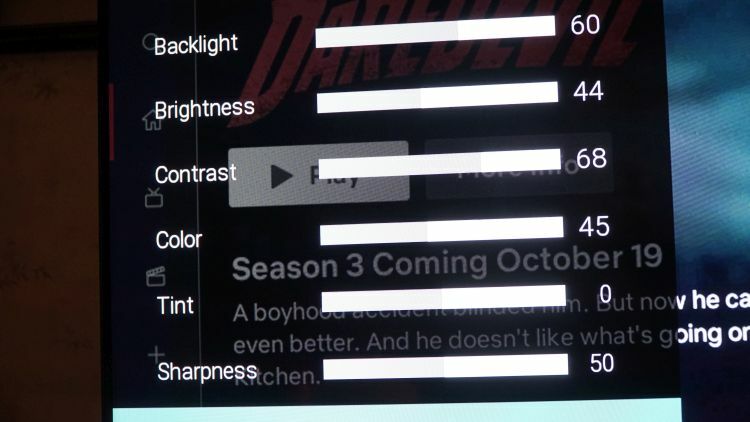 However, the majority of the world loves HDR and Dolby Vision support doesn’t exist in every TV out there. Thankfully, the M-F0 has that support with digital audio using Netflix and other apps that also support Dolby Vision and audio. With it active, the contrast potential of the monitor improves and a realistic feel to the color sets, black levels, and differentials of varying brightness on the panel are improved. 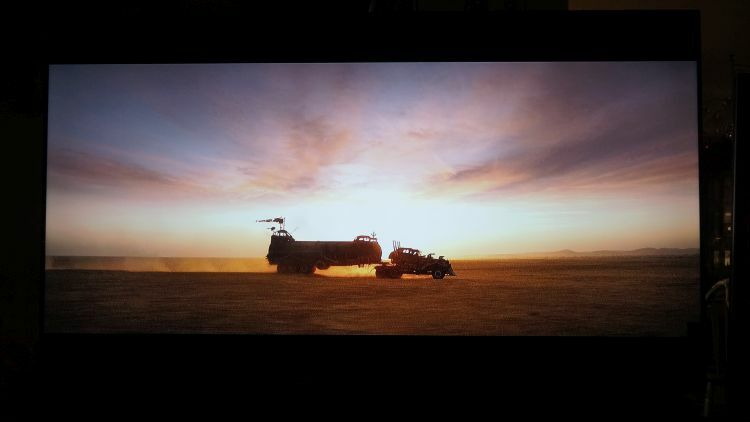 Films like Mad Max really benefit from this type of viewing experience, with a massive difference in what natural effects of color and contrast were actually intended to be when watching the movie. Much like a zero 0 level on a music player, the lacking custom options with HDR is the audio equivalent of a having EQ disabled. This set is compatible with HDR10 and Dolby Vision from an external source via HDMI. 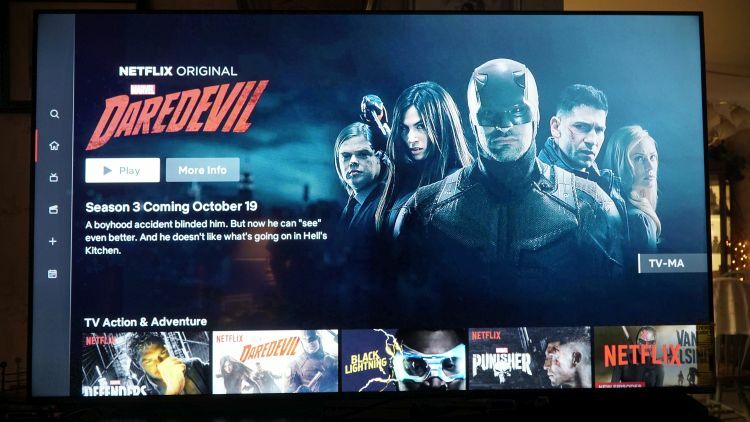 Make sure you look into whatever video streaming services you are subscribed with, in order to cross-reference compatibility in digital audio and Dolby Vision support. Not all apps function the same. 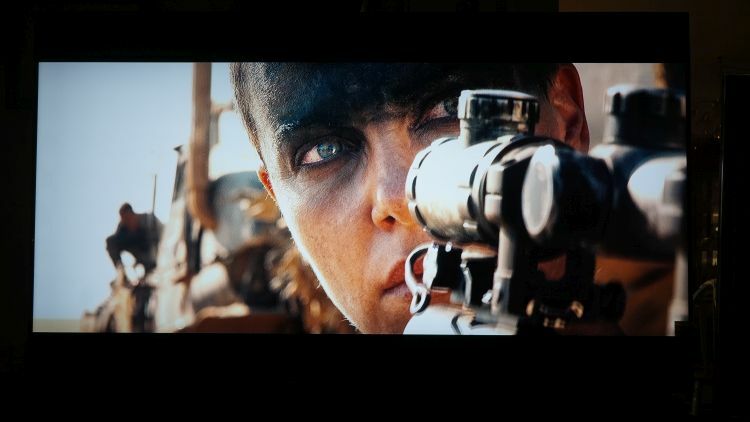 The M-F0 will let you know what is currently active in the way of HDR or Dolby Vision in a top-down bar that will slide down when the source is sending said HDR/Dolby Vision signals. Through a custom option or HDR mode active, the sharpness level of the M-F0 is what I would consider excellent tier for the sub $999 tier. I have also an older Panasonic Plasma that I have never felt the need to leave as my monitor PC Monitor. It was regarded as one of the sharpest monitors of the time, just a few years old now in 2018 and it is absolutely lacking in detail and sharpness by comparison to the LED-based M-F0. And that is a fantastic thing, because, generally, top-tier plasma options of the last generation are (at least in my opinion) better than mid-tier LED options right now. The M-F0 has excellent sharpness factor but tends to artifact (halo) a bit too much when sharpness levels hit 80+ on the custom setting and when objects are in quick motion on the screen. Sadly, Vizio’s motion smoothing options are very, very limited and weak by comparison to something like the TCL motion smoother. But, I am not really complaining too much. For the price, detail factor is very good and I can’t see anyone upset by what is offered here at the $999 level. Again, similar to audio equipment, some monitors are very pure and do not allow for much of a vivid appeal in the way of exaggeration. Some are able to create a vibrancy and richness factor can be a visual feast for the eye. 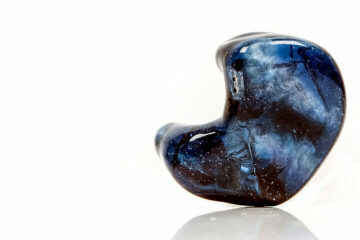 The M-F0 is more on the pure end of the spectrum, even with color vibrancy bumped fairly high. By comparison, the TCL-6 and the Sony 900E present colors in a purer sense of the word and in a similar manner. But, all of the above pale in comparison to the last generation plasma from Panasonic. Yes, the panel display is totally different (OLED, LED and Plasma all have their respective awesome qualities and plasma are still the best for absurdly beautiful color reproduction, that is, until you get to hyper-expensive OLED panels) and you are better off going for the last gen plasma vs a modern LED if you want exceptional color pop to everything. Gamers will enjoy the plasma better than the LED, but, I think everyone will want the OLED panel vs everything else for pretty much everything in the way of visuals. 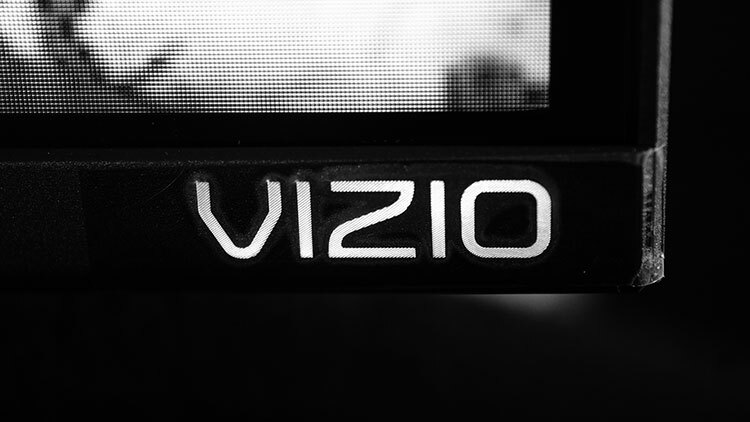 For now, the $999 Vizio M-F0 performs admirably in the way of color reproduction factor. I simply wish it would become more vibrant than what is offered when you do want to bump things up. Doing so tends to create a little bit of a wash out well before I achieve 2/3 mark on the toggle for a color boost. I am not cool with that, because the TCL lets me achieve a near 90% full toggle before I can even see anything washed out. Do not get that confused with bad color. I only mean that the M-F0 can’t’ achieve plasma or OLED levels of color vibrancy. Again, it is similar to EQ on a music board. If you don’t want that, then don’t worry. The M-F0 performs very well with color accuracy reproduction. In fact, you can drop it down a 45 or so level off the color bar toggle and still feel like you are getting an excellent color reproduction. So if you are purist and enjoy moderate color vibrancy without going overboard and have the ability to gradually turn up the vibrancy, also without it washing out fast, then this is a great set to consider. In that regard, my TCL-6 series and my Panasonic Plasma, both create too much vibrancy with a very small boost in their color settings. Sometimes, they go too far without moving the bar much at all and that is what I don’t want. I don’t have that issue with the Vizio M-F0. Sadly, the M-F0 has what I would consider poor viewing angles, meaning when you watch from a side view offset from the center, the colors will fade and wash out an uncomfortable amount. Vizio’s Clear Action Motion Smoother is relatively weak. Despite the panel rated at 120hz, the max settings for motion smoothing do not offer that very slick SOE (Soap Opera Effect) that come with some of the more expensive LG, Sony and Samsung displays out there. I really enjoy that slick feel and synced refresh rate. But, it seems like the majority of visual lovers on this Earth really hate it. So, if you want to avoid SOE, then opt for this model because not many sets beyond $999 will let you stay at a 24fps/30fps look to the experience you are watching. Pretty much all of them will have some auto SOE built in without the ability to turn it down, even on the lowest setting it will still be present. This was one reason why I bought my last gen-plasma from Panasonic for gaming needs: because it has no SOE and also has the most beautiful colors I’ve ever seen. If you want amazing SOE, this isn’t for you. What I do love is that objects in very fast motion have virtually no artifact or haloing at all. That is wonderful. I can’t say the same for many Samsung or Sony panels with the same refresh rate that are in this price tier. What you are looking for is the lowest “ms” rating possible. And at 22.0ms at 1080/4K, that is excellent for all gamers who love to play First Person Shooters online. Odds are good you will have a refresh and input lag significantly faster than most others on the other side of the net with their monitor. Call of Duty and Battlefield owners, pay attention. If you want to game on a 65-inch 4K monitor, this M-F0 is a fantastic choice for you. Wow, is all I can say here. If you let your friends know what your input last is while gaming on 4K resolutions, they will be very upset and jealous of you. The Vizio M-F0 has dual 15w speakers built in. And believe it or not, for a typical family room, they are pretty good all around with regard to midrange and treble. 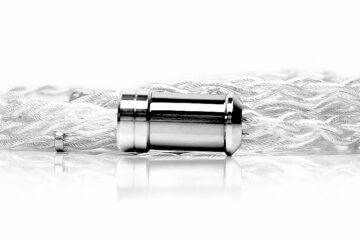 Sadly, you are going to need a sub if you want to enjoy a very deep reaching bass experience. The stock speakers are not capable of producing any rumble. Side by side with my TCL-6, the Vizio certainly sounds more crisp and clean in the midrange and treble, but the TCL-6 has significantly more bottom end and rumble potential. Both of which are completely destroyed by the stock speakers on my Sony 900E (again, a lot more expensive but can be purchased used for the same price as a new M-F0 these days) which produce enough rumble to shake my wall a bit. I think Vizio could have done a bit better here on the bass end, I would have liked to see and feel a tad more potential there that won’t get washed out with some of the sound settings being altered. I dislike the modes available inside the audio settings menu and am not able to adjust accordingly and hope to not destroy the stock quality. This sound gets much worse when mounted to a wall and without a 1 to a 3ft gap between the rear of the panel and the wall behind it. I’ve opted to not mount it to my wall for that specific reason. Thankfully, you can opt for a digital output and bypass all of that with your own speaker setup. I run through an optical converter box to RCA, which is then connected to my Audio Engine HDP6 via a speaker amp. I cannot express how great things end up sounding with a fantastic set of actual 2.1’s or even a 5.1 setup. Just be careful again with the Dolby Atmos support for audio, a lot of apps don’t support it at the moment. For now, the experience is fantastic through standard optical to RCA, which opens up a new world via sub and soundbars that make me very, very happy. If you are paying $999 for a TV, I would suggest dropping a bit extra for a cheap optical to RCA converter and then run that into your 2.1 speakers. From there, new possibilities will open and feeling immense staging and rumble factor with the said new set of speakers is always amazing. Especially so if you are gamer! The Vizio M-F0 is easily one of the best $999 TVs on the market. Not much else out there has input lag like this, so it is seemingly specifically tuned for gamers and those who want more of a purist view on color reproduction. The motion smoothing function is something I wish Vizio would enhance in a future firmware because I enjoy SOE a lot and simply want more of it. At this price, you can’t do much better in a 65-inch model. The local dimming zone quantity count is good and black levels and contrast are quite shocking at times. The M-F0 is an absurdly good choice for the all-around video enthusiast. I am very happy with it and it will certainly be my primary gaming monitor for the foreseeable future. That 22.1ms input lag rating is amazing. Great job, Vizio! Can’t wait to see what else you can do with your near future models in 2019 if this 2018 model nearly doubled the performance in input lag from the previous model.